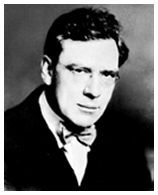 Maxwell Anderson was born in Atlantic, Pennsylvania on December 15, 1888. His father was a traveling minister, so the Anderson family moved frequently throughout Maxwell's youth. He attended schools throughout Middle America, in Ohio, Iowa, and North Dakota, as well as Pennsylvania. He graduated from the University of North Dakota in 1911, and then in 1914 he earned his M.A. degree from Stanford University. For a while, he went into teaching, first at Stanford, and then at California's Whittier College, but he left to embark on a career in journalism. He worked for a number of newspapers, including the Grand Forks Herald, the San Francisco Chronicle, and the San Francisco Bulletin, and moved on to writing editorials for a variety of publications, most notably the New Republic, the New York Globe, and the New York World. Anderson's real calling, however, was to be a playwright. He loved words, poetry, and music, and he began to focus on writing for the theater. His first play, White Desert, was written in verse, but it was not very successful. After several poorly-received works, he hit the big time when he collaborated with Laurence Stallings in 1924 on What Price Glory?. Its success allowed him to leave the newspaper business entirely, becoming one of the most prolific playwrights of his time. In 1933 he won a Pulitzer prize for Both Your Houses. A string of successes followed, and his 1935 verse drama Winterset earned him the New York Drama Critics award. Maxwell Anderson continued to dominate the American theater for years. When he died in 1959, he left behind a huge volume of his work, including more than thirty published plays, as well as more than a dozen unpublished ones, a volume of poetry, and a collection of essays. If you are a serious student of the theater, you will want to purchase Barbara Lee Horn's guide to the works of Maxwell Anderson. Click here to purchase Maxwell Anderson by Barbara Lee Horn, directly from Amazon.com. This book provides synopses and critiques of 33 of Anderson's plays, a biographical essay, stage histories, cast information for his major productions, and annotated bibliographies. It is a comprehensive guide to the works and career of this prolific American playwright.